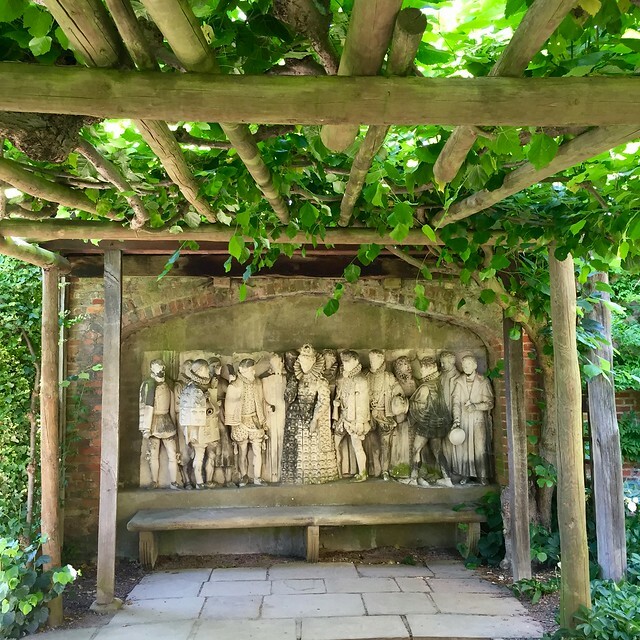 The tube strike and a sunny day sent me off to Hatfield House Gardens last week. The entrance to the house and grounds is right opposite Hatfield rail station, so it’s perfect for people like me who don’t travel by car. The House is well worth a visit too, but I was there to see the beauties of the formal gardens. Robert Cecil, First Earl of Salisbury built the Jacobean Hatfield House in 1611, next to the site of the Old Palace of Hatfield. It’s been in his family ever since. The Old Palace and its deer park previously belonged to Henry VIII but James I swapped it for Robert Cecil’s house, Theobalds. 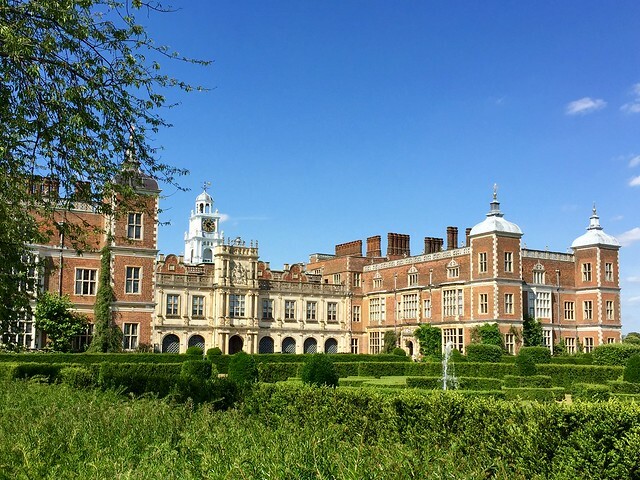 Hatfield House’s main claim to fame is that Elizabeth I learned of her accession to the throne while she was living in the Old Palace in 1558. 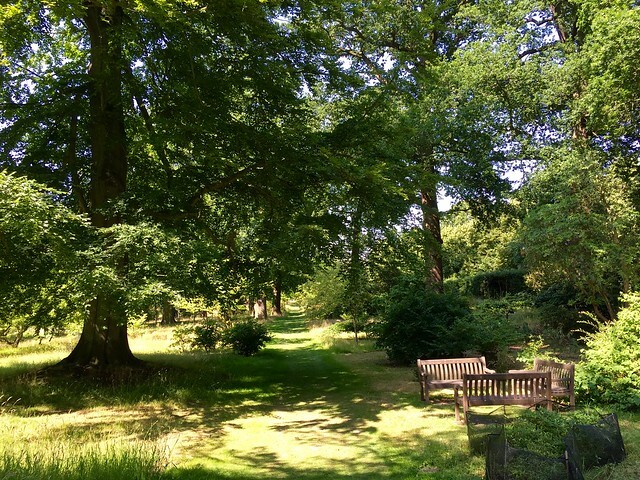 There are magnificent views of the house from a viewing point in the woodland garden. 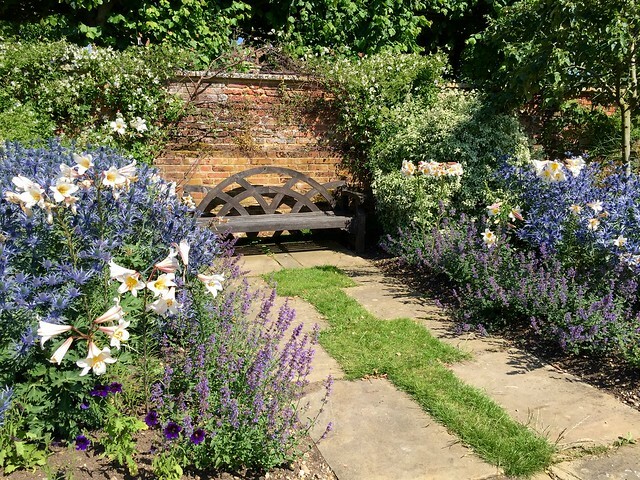 And from the west garden with its central fountain and herbaceous borders. 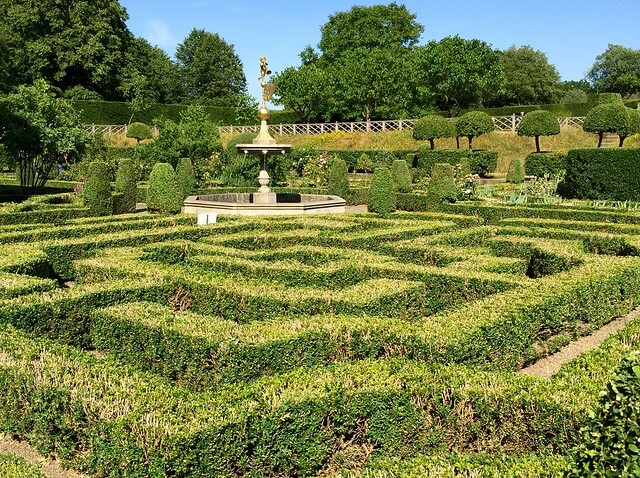 The west gardens are enclosed by an avenue of pleached lime leading to two stone carvings by J.G. Bubb taken from the facade of the Royal Exchange after a fire and brought to Hatfield in 1855. 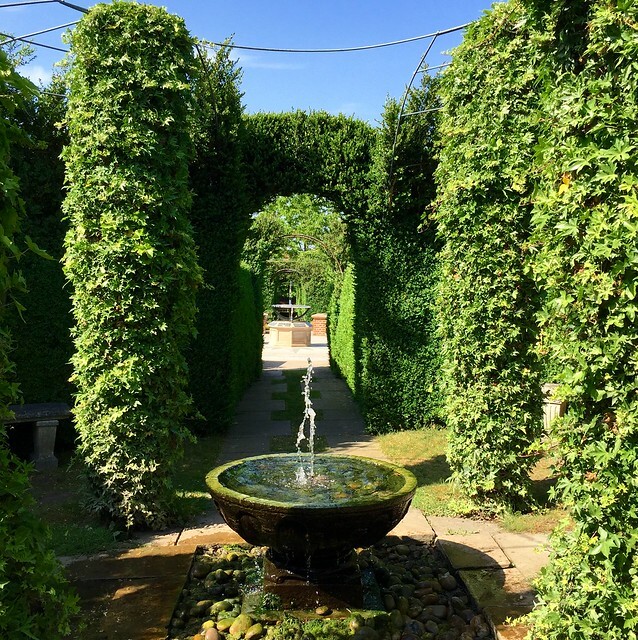 The charm of the west gardens is the way they form a series of outdoor rooms, divided off by box hedges. It’s highly formal and rather intriguing. 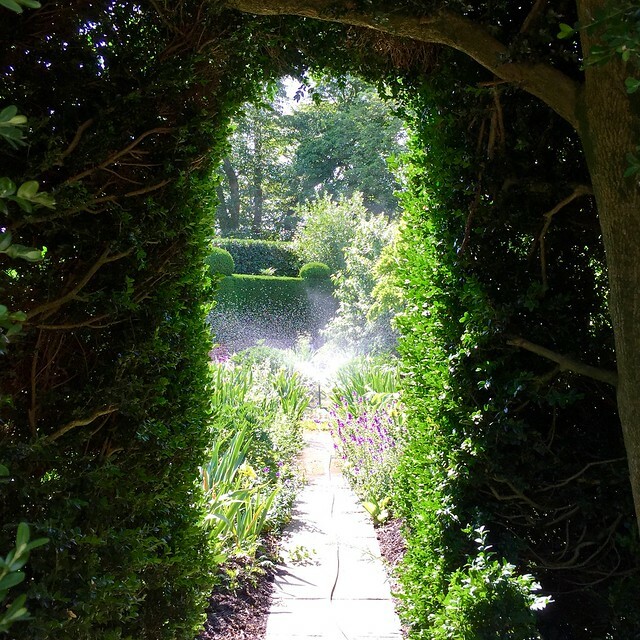 But if the formality is too much for you, a stroll through the woodland garden will soon put you right. One wing of the Old Palace, built in about 1485 by the Bishop of Ely, John Morton, still stands. It’s one of the foremost examples of mediaeval brickwork in the country and originally formed a quadrangle around a central courtyard. The Old Place garden now occupies the old courtyard space. 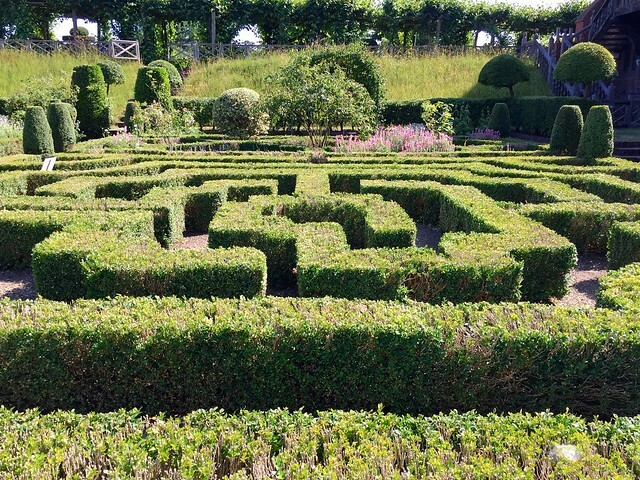 It’s an intricate knot garden, incorporating a mini-maze in one of its quadrants. 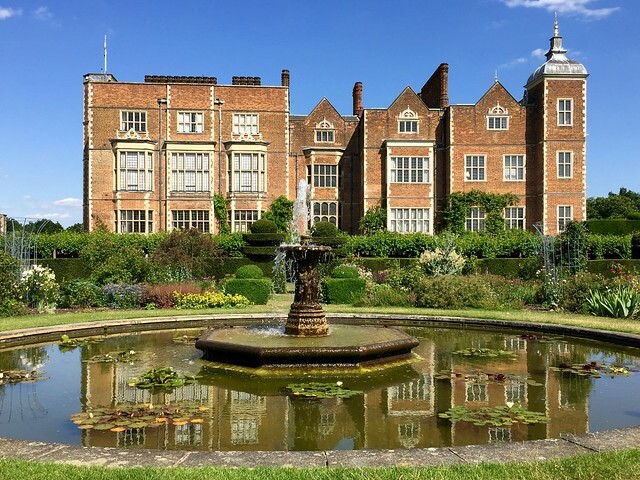 Entry to the gardens and park of Hatfield House (not including the house) is £10 but if you get your ticket stamped you can go back whenever you like for the rest of the 2015 season. Hatfield is on the Great Northern railway line from Moorgate to Welwyn Garden City. 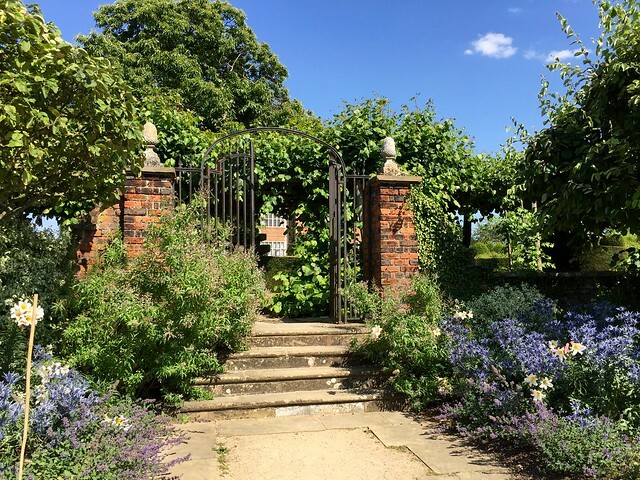 This entry was posted in Flowers and plants and tagged arts, flowers, gardens, Hatfield House, London, nature, plants, Robert Cecil by Fran. Bookmark the permalink. We all love Hatfield House !!!!! 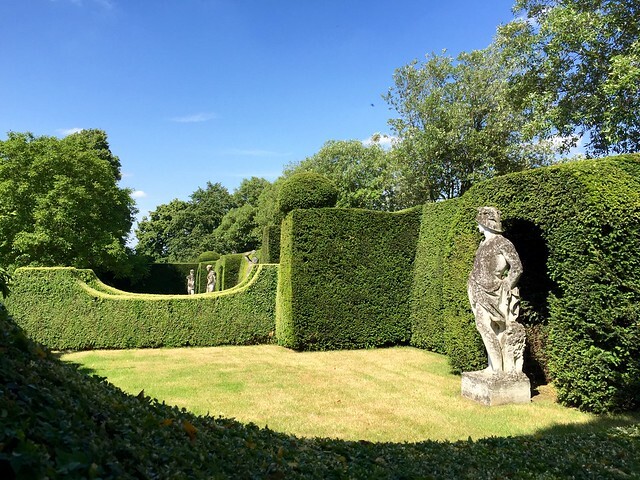 It looks a marvellous garden – I have added it to my list! Photographing on very bright days is something I find difficult – exposing for the extreme contrasts of the light – How do you deal with the problem? Another uplifting post from you which is what we all need! Especially as the weather has turned so gloomy. Love the carving from the Royal Exchange. What a great idea and from so long ago!